The clay proportion in the base coat was reduced by adding grit/stone dust. Apart from the straw, the fibre content was increased by adding paper-mache newspapers shredded and soaked in water, were added to the plaster mix along with ash. cracking does reduce, but the plaster flakes on impact. perhaps a higher clay percentage should do the trick. The following proportions are to be taken with a pinch of salt. Not literally of course. The proportions and ingredients will change with every soil. Step 1: Put cement between the bags in the gaps. Step 5: Trowel the plaster smooth. Caution: Research the techniques used by plaster professionals in your area and follow their lead. The techniques in this video show what works in a rainy/humid climate, but they can cause problems in dry climates. This garden bed was an experiment, it was built on a shore line of a large lake. I wanted to see how earthbags and plaster held up to water. What I didn't expect was the lake levels rising higher than ever before. I also didn't expect such large waves; the garden bed was battered for countless days. The plaster held up well when submerged in water, but it was unable to hold up to the constant barrage of large waves. Luckily the garden bed drains very well, most of the plants recovered. 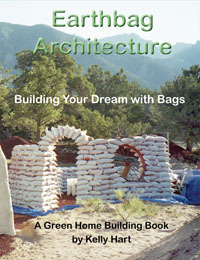 I was impressed with the strength and affordability of this earthbag structure. The cost to build this was appox $80.